American Indian activist Russell Means, seen here at his Scottsdale, Ariz., home in October 2011, helped lead protests for Native American rights. Russell Means, the American Indian activist who helped lead the 1973 uprising at Wounded Knee and who later became a Hollywood actor, has died. He was 72. Means died Monday at his ranch in Porcupine, S.D., on the Pine Ridge Indian Reservation, Oglala Sioux Tribe spokeswoman Donna Salomon said. 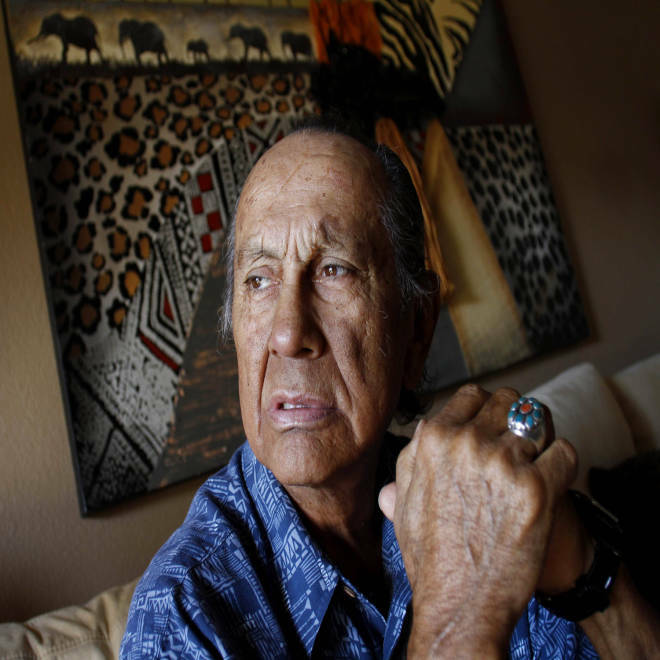 The firebrand former leader of the American Indian Movement and one-time Libertarian Party candidate for U.S. president had been battling advanced esophageal cancer. Born on the Pine Ridge Indian Reservation, Means joined the American Indian Movement in 1968 and soon became one of the group's prominent leaders. He took part in an occupation of the U.S. Bureau of Indian Affairs headquarters in Washington in 1972, and helped lead the 71-day standoff with federal authorities at Wounded Knee on Pine Ridge in 1973. He found himself dogged for decades by questions about AIM’s alleged involvement in the slaying of a tribe member and the several gun battles with federal officers during the occupation of Wounded Knee, but denied the group ever promoted violence. Russell Means, an American Indian activist who led the 1973 uprising at Wounded Knee, died Monday at his ranch in Porcupine, S.D. NBC's Brian Williams reports. "You people who want to continue to put AIM in this certain pocket of illegality, I can't stand you people," Means said, lashing out an at audience member question during an April gathering commemorating the uprising's 40th anniversary. "I wish I was a little bit healthier and a little bit younger, because I wouldn't just talk." Means told The Associated Press in 2011 that before AIM, there had been no advocate on a national or international scale for American Indians, and that Native Americans were ashamed of their heritage. "No one except Hollywood stars and very rich Texans wore Indian jewelry," Means said. "And there was a plethora of dozens if not hundreds of athletic teams that in essence were insulting us, from grade schools to college. That's all changed." Feb. 27, 1983: NBC's Chris Wallace and Fred Briggs look back at Wounded Knee South Dakota on the 10th anniversary of the takeover that was led by Russell Means of the American Indian Movement. The movement eventually faded away, the result of Native Americans becoming self-aware and self-determined, Means said. Means had fought for Native American rights since the 1960s, when he first protested college and professional sports teams' use of Indian images as mascots, which he said were demeaning caricatures of his people. 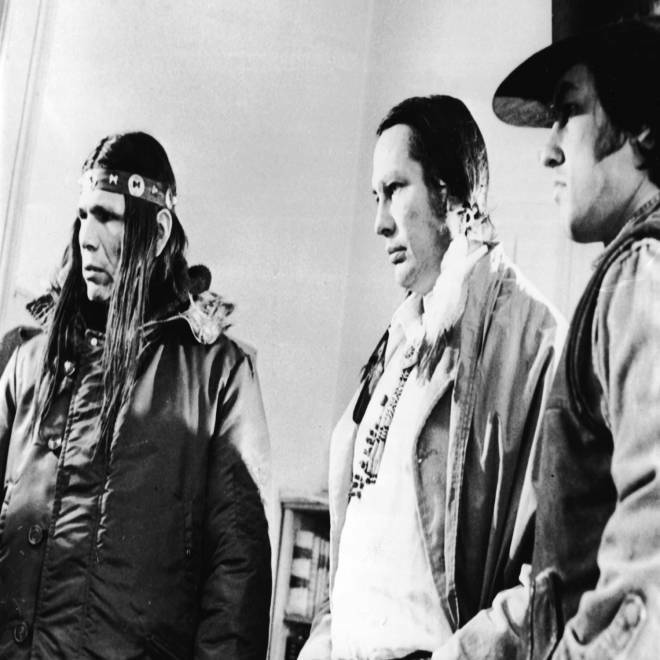 Leaders of the American Indian Movement, from left, Dennis Banks, Russell Means and an unidentified third man appear at a press conference to list demands of the federal government for an increase in financial aid for the town of Wounded Knee, S.D., on March 16, 1973. Means was arrested numerous times during his long career of protest and spent several periods in jail. He ran unsuccessfully for president of his tribe and sought the Libertarian nomination for U.S. president, losing to Congressman Ron Paul at the party's 1987 national convention. Means’ acting career began in 1992 when he portrayed Chingachgook alongside Daniel Day-Lewis' Hawkeye in "The Last of the Mohicans." He also appeared in the 1994 film "Natural Born Killers," voiced Chief Powhatan in the 1995 animated film "Pocahontas" and guest-starred in 2004 on the HBO series "Curb Your Enthusiasm." Means kept busy with his Hollywood career even as he battled the cancer that finally took his life. The Internet Movie Database reports that Means had recently completed projects, and had more in the works. Means appeared in a film called "Tiger Eyes," which was based on a Judy Blume novel. Means' son, Tatanka Means, starred. The film screened Sunday at the Sante Fe Independent Film Festival. The Means duo also are credited in "Winnetou: The Beginning," set for a 2013 release. Means recounted his life in the book "Where White Men Fear to Tread." He said he pulled no punches in his autobiography, admitting to his frailties and evils but also acknowledging his successes. "I tell the truth, and I expose myself as a weak, misguided, misdirected, dysfunctional human being I used to be," he said. Salomon, the tribal spokeswoman, called Means' death a "great loss" for the Oglala Sioux Tribe.